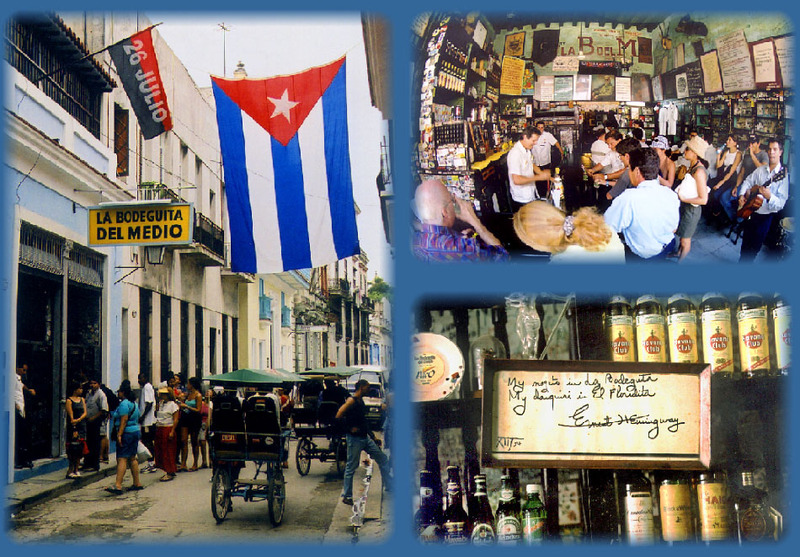 If you are in Havana and want a great Mojita at the legendary bar made famous by Ernest Hemingway, then you must have a drink at The Bodeguita del Medio, Empedrado 207, Habana Vieja (Old Havana). Comida Criolla y Mojitos (Native food and Mojitos), what a great place to eat and drink. Located just around the corner from Cathedral Square. The walls are covered with signatures of its patrons from the day it opened. Famous signatures such as Hemingway's and Salvadore Allende's are protected under glass. The top right photo shows the main floor small bar, frequented by tourists who want a drink at this famous establishment but who choose not to dine. The lower right image is Hemingway's signature dated December 1954. No visit to Havana is complete without a Mojito at La Bodeguita.